The Conservatives have held onto former prime minister David Cameron's Witney seat - but saw their majority dramatically slashed. Robert Courts won the by-election for the Tories, triggered by Cameron's resignation last month, with 45% of the vote. But the Tories's majority in Conservative-strong Witney was significantly reduced from 25,000 in 2015 to under 6,000 this time round. The Liberal Democrats made the biggest gains, coming second in the election with 11,611 votes, compared to Courts's 17,313. UKIP's Mark Reckless has been forced to deny clashing with his new party leader Nigel Farage, after he sparked controversy by suggesting EU migrants may have to leave the UK if Britain leaves the European Union. Political Correspondent Romily Weeks reports. The decision to go into coalition combined, with the Government's policies means the Tories stand no chance of an overall majority at next year's general election, Ukip defector Mark Reckless has said. Speaking at the eurosceptic Bruges Group this morning, Mr Reckless said he had not thought a Conservative victory was a "serious prospect" since David Cameron went into coalition with Nick Clegg. Ukip MP Mark Reckless addressing an audience at the Bruges Group. "That is largely because that decision led to unity on the left and a significant increase in the Labour vote due to departing Lib Dems," he argued. He also hit out at Mr Cameron's leadership, saying: "How David Cameron and the Conservative-led government have governed over the last four and a half years has also tended, to put it mildly, to reduce the prospects of the Conservative Party being successfully returned at the next election." However, he said the impact of Ukip's surge on Tory-held seats would be "small if any", whereas Ukip "can actually win seats in Labour areas from people who would never dream of voting Conservative. Ukip's latest MP Mark Reckless has suggested his party's policy was "changed" in the wake of a row over comments he made about European migrants in a pre-election hustings. Mr Reckless said he was in "very close contact" with Ukip leader Nigel Farage before the ITV hustings on Wednesday, the day before the poll, when opponents argued that he appeared to suggest European Union migrants could be asked to leave if the UK quit the alliance. Until Nigel changed it on Wednesday, the policy of the party was everyone can stay for the transitional period, no doubt about that, that there would then be a permanent arrangement which would be part of the EU negotiation. The policy changed on Wednesday and I'm a bit sore about how I sort of came out of that, because I don't actually think I said I was only talking about welcoming people of particular circumstances. I've always thought we should allow people to stay permanently, regardless, because that's the right thing to do by them and it's also the right thing for our party in terms of how we want to look to the country. More: Will the Ukip phenomenon change British politics? 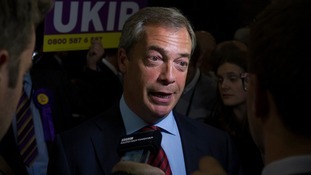 Will the Ukip phenomenon change British politics? Conservative defector Mark Reckless won Rochester and Strood for Ukip with a margin of nearly 3,000 votes. 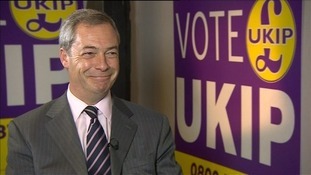 As the by-election triumphs for Ukip grew the claims of a turning point in British politics came thick and fast. 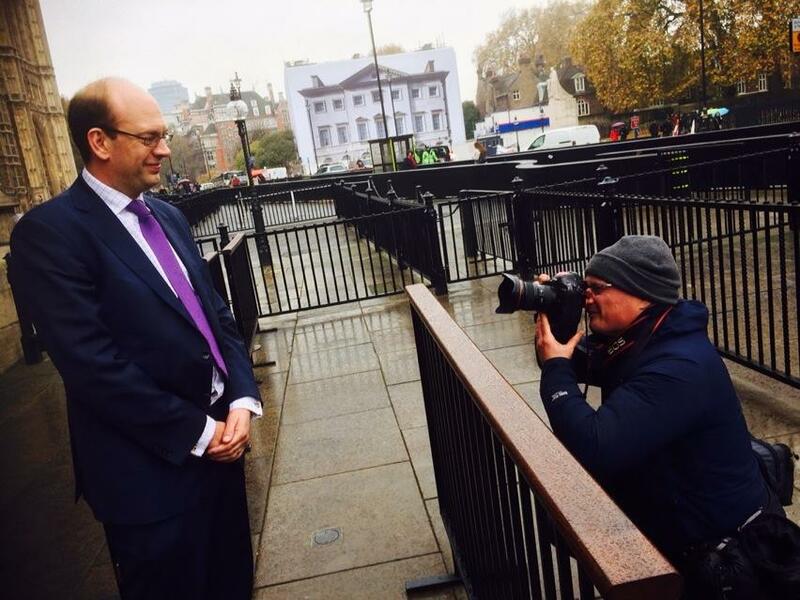 Mark Reckless' first day as a Ukip MP in Parliament has been documented by fellow Tory defector Douglas Carswell, including a "selfie" of the celebratory pair. Mr Reckless was this morning sworn into Parliament after following Clacton MP Mr Carswell in successfully regaining the seat he relinquished upon switching from the Conservatives to Ukip. Ukip leader Nigel Farage has revealed he will demand a referendum on Britain's membership of the EU next summer as a condition of entering a coalition with any other party. He said that was their only 'red line issue' - and if the party with the biggest number of MPs following the General Election was not willing to offer that deal, he would refuse to partner up with anyone. The only thing that would make us want to cooperate with anyone after election is a referendum before the summer recess next year. Ukip leader Nigel Farage has welcomed the election of Ukip’s second MP, as Mark Reckless was voted in after a by-election in Rochester and Strood. In interview today, Mr Farage said he believed the Tories had “tried too hard” in their election campaign, and said he believed Mr Reckless had done the right thing by letting his constituents decide whether to keep him in his seat after defecting. I think what Mark Reckless did was he didn’t just cross the floor and defect to Ukip, he said ‘I’m resigning my seat, I’m trusting you, the people of Rochester and Strood, to decide to back me or sack me. And people like that – they admire courage, they admire bravery, they admire decency. I think the second reason is - I actually think the Conservatives tried too hard. This full-scale bombardment, the numbers of phone calls houses were getting, that sort of thing. He denied that he was riding on the back of protest votes, saying people "absolutely believed" in what the party stands for. Ukip MP Mark Reckless has been sworn in following his re-election to Rochester and Strood before finding his new seat in the opposition benches. 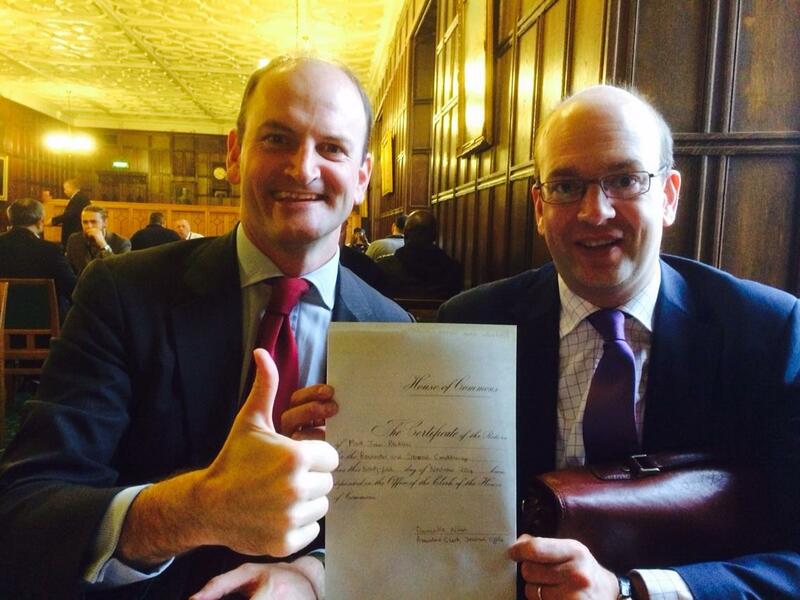 Mr Reckless made his oath after approaching the dispatch box alongside fellow Tory defector Douglas Carswell. Mr Reckless faced some heckling from Labour MPs on the opposition bench which Mr Carswell has used since his return to Parliament last month. 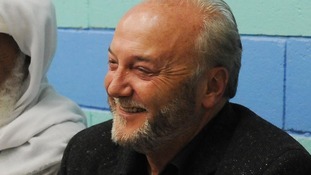 The Ukip duo will sit together in the second row of the opposition benches, behind Labour veteran Dennis Skinner. David Cameron has said he is "absolutely determined to win" the Rochester and Strood seat back after Conservative defector Mark Reckless's victory for Ukip. I'm determined to win back Rochester and Strood at the election - anything other than a Conservative Govt would put our recovery at risk.